The Desktop Behavior page of the KDE Control Center allows you to control certain aspects of the dekstop behavior, including the actions taken when mouse buttons are clicked. It contains three tabs. 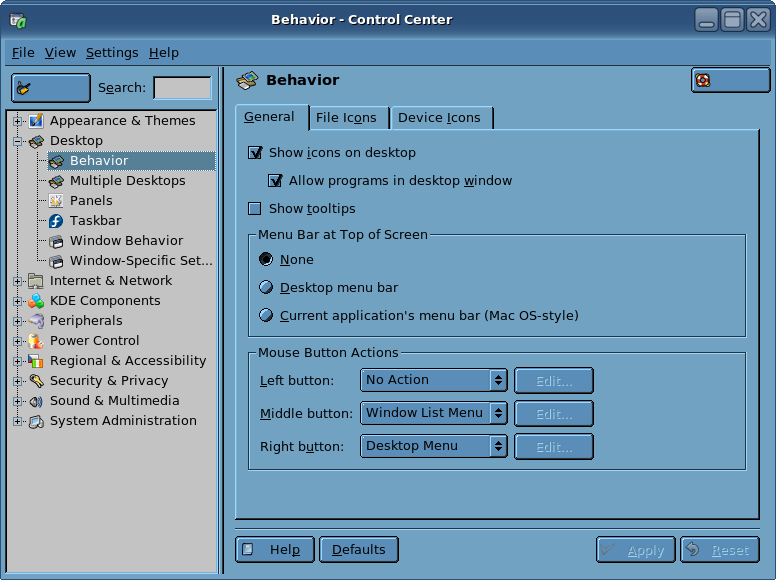 Figure 34: The Desktop Behavior page of the KDE Control Center gives you control over several aspects of desktop behavior including what actions to take when a mouse button is clicked. The first tab, General, determines whether icons are shown on your desktop at all. If you deselect the checkbox titled Show icons on desktop, no icons will be displayed on the desktop at all. The Trash and Home icons will disappear when you click the Apply button. This action does not remove any files or folders already stored on the desktop, they will simply be hidden. If this option is enabled, you may also enable the ability to Allow programs in desktop window. Enabling this option allows you to set a program as your desktop background, for example xearth, or KworldClock. Thus the program becomes your desktop and nothing else can be display on the desktop except for the windows of running programs. The other two tabs, File Icons and Device Icons determine what types of icons are displayed on the desktop. This includes icons for various types of devices such as CD-ROM and DVD drives, removable media such as thumb drives, sound files, and so on. In any event, I strongly recommend against storing files on your desktop. Using these options would mean that the desktop icons would no longer be accessible to you. Files should be stored in in your home folder (directory) or in appropriate subdirectories (sub-folders).